im with you on the rules….takes all the fun out of the pool. maybe they could require you to have your hair in a ponytail holder thing. sorry that you had to miss the floating feeling and the dolphin dives. umm i love the feeling of water all over and the smell of cholrine. mostly the weightlessness. Joan, I SO wish I could simply pin my hair up and be done with it. I can appreciate the thought behind the rule, but the practical reality (for me at least) is – it ain’t working! I too LOVE the feeling of freedom & weightlessness swimming imparts. It stinks not being able to enjoy myself wholeheartedly in the pool. Hah! Some of the photos that came up when I googled “hairy man in pool” were downright frightening. The internet is a weird & wild place! OOoh Adrianne, let me know! I’ve never heard of such a thing! And really, are people with long hair losing any more hair than people with short cuts? Dumb. If you pull your hair on top of your head into a bun, that’s technically less than chin-length, right? Win! I’m going to go throw up from that hair shirt now. Yeah – I’ve tried that (pinning it up). No go. I even got so desperate I thought, well Gee, maybe I should just cut my hair, but then I sobered up. 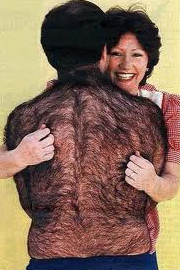 You know some women really love hairy men. But even they might feel that hair shirt is of biblical proportions. You actually made me LAUGH OUT LOUD with that knee high comment. Maybe I should just go one further and show up with a full pair of pantyhose on my head, the legs dangling to each side. They pull out my hair and my hair isn’t even that long!! 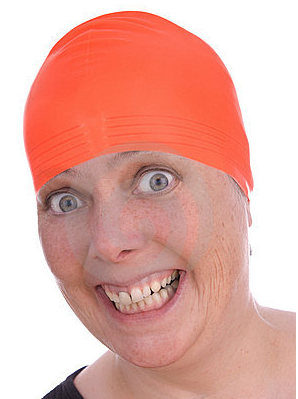 Boo, swim caps. I second that Hayden. BOOOOOOOO. PS: my kids are watching bugs bunny and he JUST put on a swim cap – too funny. Whoa!! That’s a new one! I’ve never come across a rule like that…. I don’t think I’d be a very good sport about it at all. I hate the feel of stuff on my head when I’m underwater. Man you’re brave. I can’t take cold water with my wacky ear – it leaves me aching.